You can make a layer follow the movement of the camera, so that it always appears in the same area of the camera field no matter the position of the camera. NOTE If you are working on a 3D scene, see Aligning 2D Layers with a 3D Camera. In the Layers view, select the layer you want to pin to the camera. 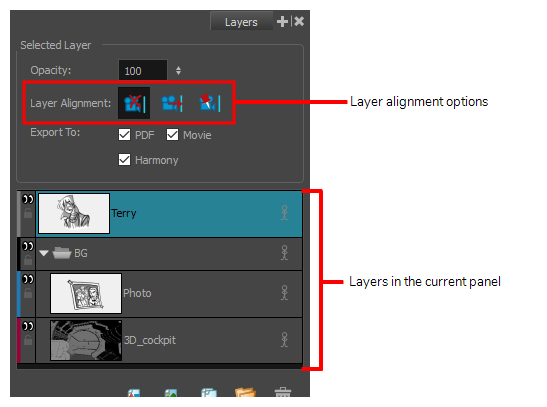 In the Layer Alignment options, click on the Pin Layer to Camera button. NOTE To unpin the layer from the camera, select No alignment . The other option, Face Camera , is for 3D scenes—see Aligning 2D Layers with a 3D Camera.